At Strong Tie Insurance, we recognize that privacy is important. This policy applies to all of the services we offer, as well as those offered by our subsidiaries or affiliated companies, if any. When you engage us to provide insurance services, we will ask you for personal information (such as your name and email address). If you decide to request an insurance quote through Strong Tie Insurance, we will also request certain personal information (such as your Social Security number or birth date and account information), which we maintain in encrypted form on secure servers. We may combine the information submitted under various forms and services in order to provide customers with a better experience and to improve the quality of our services. For certain services, we may give customers the opportunity to opt out of combining such information. If we propose to use personal information for any purposes other than those described in this Policy and/or in the specific service notices, you may “opt-out”—or say no to—having your information shared by calling 877-385-5314 or contacting us through our contact page. We will not collect or use sensitive information for purposes other than those described in this Policy and/or in the specific service notices, unless we have obtained your prior consent. We have a Good Faith Belief that access, use, preservation, or disclosure of such information is reasonably necessary to (a) satisfy any applicable law, regulation, legal process or enforceable governmental request, (b) enforce applicable Terms of Service, including investigation of potential violations thereof, (c) detect, prevent, or otherwise address fraud, security or technical issues, or (d) protect against imminent harm to the rights, property, or safety of Strong Tie Insurance, its users, or the public as required or permitted by law. Our intellectual property is provided for your information, so we want you to feel free to access our website, download, save, and/or print any information you need. However, just as you protect your property from theft and inappropriate use, we need to protect our intellectual property from similar harm. 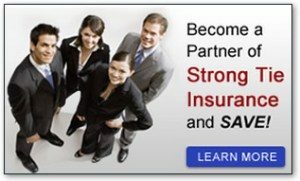 All of the materials on this website, including the organization and layout of this website and all graphics and logos, are owned and copyrighted by Strong Tie Insurance. You may access, download, and print materials from this website for your personal noncommercial use, but understand that by doing so you do not obtain any rights, interest, or title to the materials you read, print, or download. You cannot copy, modify, distribute, transmit, display, perform, reproduce, publish, license, create derivative works from, link to, or frame in another website or use on any other website, or transfer or sell any information obtained from this website without written permission from Strong Tie Insurance. Note that all information on our website is designed and intended for “human consumption” and not machine interpretation. Accordingly, data extraction techniques such as web or screen scraping are strictly prohibited. By using this website, you warrant to Strong Tie Insurance that you will not use this website or any of its contents for any unlawful use, or any use that is otherwise prohibited pursuant to these terms. Any violation of this provision will result in prompt revocation of our permission granted to you to use this website. All information, services, products, or other material on this website are provided “as is” without warranty of any kind. In no event shall Strong Tie Insurance, its affiliates, suppliers, and/or its agents be liable for any direct, indirect, incidental, special, or consequential damages arising out of or in any way connected with the use of this website or with the delay or inability to use this website, or for any information, products, materials, and/or services obtained through this website, or otherwise arising out of the use of this website, whether based on contract, tort, strict liability, or otherwise, even if Strong Tie Insurance, its affiliates, suppliers, or any of its agents has been advised of the possibility of damages. Because some states/jurisdictions do not allow the exclusion or limitation of liability for consequential or incidental damages, the above limitation may not apply to you. Buy renters insurance, truck insurance, homeowners insurance, auto insurance, rv insurance, boat insurance, condominium insurance, restaurant insurance, commercial vehicle insurance, business insurance, bonding services, commercial property insurance, commercial vehicle insurance, seguros de auto, aseguranzas, seguros, California Worker’s Compensation, general liability insurance, excess liability insurance, motorcycle insurance, rv insurance, earthquake insurance, umbrella insurance, off-road vehicle insurance, flood insurance, Los Angeles, Pasadena, Glendale, Burbank, Hollywood, East Los Angeles, South Gate, Bell, Bell-Cudahy, Wilmington, Long Beach, Paramount, Lynwood, Compton, Norwalk, Downey, Bellflower, Lakewood, Pico Rivera, Huntington Park, Commerce, Montebello, Whittier, Van Nuys, Woodland Hills, Panorama City, North Hollywood, Canoga Park, Riverside, Moreno Valley, Redlands, Fontana, Corona, Ontario, Chino, Rialto, Perris, Sun Valley, Sunland, Pacoima and San Fernando.